We provide a platform where customers meet good, honest and reliable small jobs service providers. My Small Jobs is a business with the vision and ambition to support small businesses and the self employed. We provide a platform where customers meet good, honest and reliable small jobs service providers. At My Small Jobs we also empower and provide knowledge to small businesses in the form of training. Our training arm is there to continually provide continuous professional development to our service providers and the public. It is every customer’s expectation that service providers are honest, reliable trustworthy and above all produce the expected quality of work. However, this has not always been the case in most customer experiences. At My Small Jobs we aim to push hard to ensure our customers are always satisfied with the services they receive through our providers. Our vision therefore is to bring together honest, reliable, trustworthy and experienced service providers and customers to a common platform. To achieve our vision, we strive to recruit the best service providers to sign up on our platform whilst at the same time providing training and continuous professional development to make our service providers the best in the marketplace. My Small Jobs is a platform where customers find and use vetted, reliable, trustworthy and dependable service providers. Whilst we do not directly provide these services we take pride in ensuring that the services offered by our service providers are of high standard and quality. 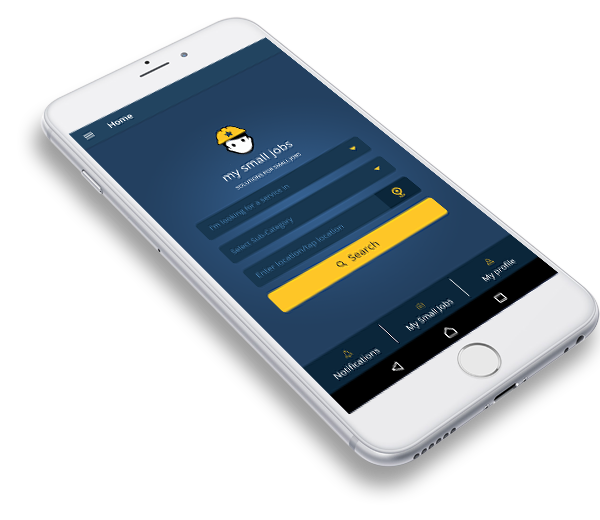 My Small Jobs app was designed with the customer in mind. It is user friendly and easy to use in 4 simple steps. Below or excerpts of what some of our customers are saying about My Small Jobs. What a great idea; solutions for small jobs. It is convenient and very easy to use. All I did was to follow four simple steps to find a service provider. I will always recommend My Small Jobs. I didn’t know My Small Jobs also offer training. I attended the “Essentials of Project Management training and what an eye opener it was. I think I can talk more on some useful aspects of project management. It was an eye opener and I commend you for the opportunity. I urgently needed a painter for my new flat and it was great how I quickly found a painter to do my job. In the end it was very convenient to also pay via the app. This is the most convenient app I have found. It’s a wonderful and brilliant idea. Download My Small Jobs Now!